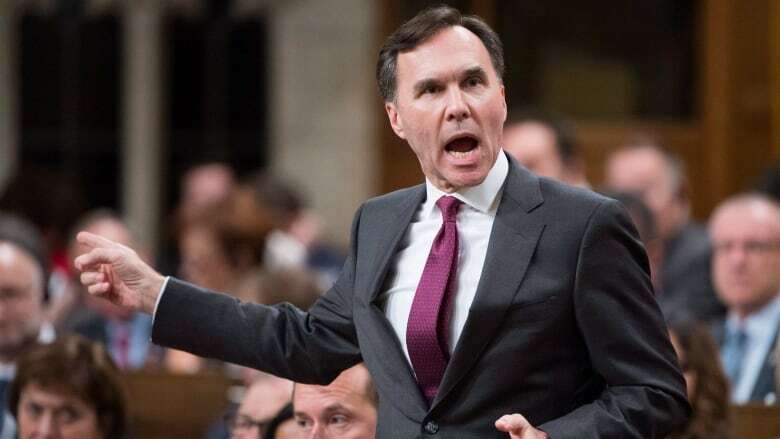 Finance Minister Bill Morneau found himself fending off fresh Opposition broadsides Thursday during another fiery question period — this one so heated that one Conservative MP was booted from the House of Commons. Finance Minister Bill Morneau found himself fending off fresh Opposition broadsides Thursday during another tumultuous question period — this one so turbulent a Conservative MP was booted from the House of Commons. Morneau has been at the centre of an ethics controversy for weeks, and the latest questions were focused on new revelations his father sold off about $1.5 million shares in their family-built company right before the minister made a major 2015 tax-change announcement. Opposition MPs say they believe the tax news led to a dip in the stock market — including the value of Morneau Shepell shares. All week, the Conservatives and the New Democrats have been grilling the Liberals about Morneau's late-2015 sale of millions of dollars worth of his own shares in Morneau Shepell Inc. The transaction took place days before the Dec. 7 announcement. They insist the early sale resulted in a savings of half a million dollars. Opponents allege Morneau's 2015 tax news, which included the government's plan to raise income taxes on the highest earners, had a wide-reaching impact because it encouraged wealthier shareholders to sell off some their stock before the changes came into effect on Jan. 1, 2016. It's likely difficult to pin down the market impact of the tax-change announcement, which was made at a volatile time in the economy. That day, the Toronto stock index fell 2.4 per cent and oil prices dropped about five per cent. On Thursday, the finance minister's political foes seized on new information about two large 2015 sales of Morneau Shepell stock of 100,000 shares each. This time they were sold by Morneau's father, William Morneau Sr., on Nov. 23 and Dec. 3. Conservative MP Pierre Poilievre said the value of the shares fell five per cent in the days that followed, but not before "someone" got out. "Correction, it wasn't just someone — there was someone else," Poilievre said, referring to the sale made by Morneau's father, who founded the company. An angry Morneau, visibly upset that his family had become a Conservative target, responded by saying he didn't think Poilievre "could sink any lower." "If he wants to insinuate something about me, he should say it here, he should say it now and he should say what he means," Morneau said in the House, where MPs enjoy the legal protections afforded by parliamentary privilege. "And then he should move it out into the foyer, because truth matters." The unparliamentary Conservative heckling that punctuated the debate eventually became too much for Speaker Geoff Regan, who "named" Tory MP Blake Richards — a rare show of authority that results in the offending member of Parliament being escorted from the chamber by the sergeant-at-arms. Neither Richards nor Regan were immediately available to talk about the incident. Thursday's rowdy session came a day after Conservative Leader Andrew Scheer demanded Morneau's resignation —not only because of questions about the 2015 stock sale, but due to other conflict-of-interest allegations that have been dogging the finance minister for weeks. The controversy has emboldened some opposition MPs, who have taken the government up on Prime Minister Justin Trudeau's challenge to repeat their questions about the stock sale outside the House, where he has suggested they would face legal action. Tory MP Gerard Deltell called such threats "arrogant" and promised his party would continue to ask their questions. After question period, Morneau made the point that the tax-change announcement wouldn't have come as a surprise to the public or the markets, since it was central to the Liberal campaign platform. He also referenced a November 2015 news report that quoted cabinet colleague, Dominic LeBlanc, saying the Liberals would introduce the tax measures at the start of 2016. Morneau, who denied disclosing confidential information to his father or anyone else, said he started the process of selling his own shares shortly after he was elected in October 2015. But he said he couldn't recall the exact date. The minister has been battling several high-profile controversies since the summer. He has also faced intense political pressure over how he handled his personal financial arrangements after coming to office. The questions have focused on his shares in Morneau Shepell, the company where he was executive chairman until his election win. In response to the controversy, he sold off the remainder of his holdings in the pension management firm — worth about $21 million — and promised to place his other substantial assets in a blind trust. Morneau donated to charity the difference between what the shares were worth at the time of the sale and their value in 2015 when he was first elected — estimated at about $5 million. He has also faced conflict-of-interest allegations over proposed pension reform — spearheaded by Morneau — that opponents say would bring him personal financial benefit. The federal ethics commissioner has launched a formal examination into the matter.